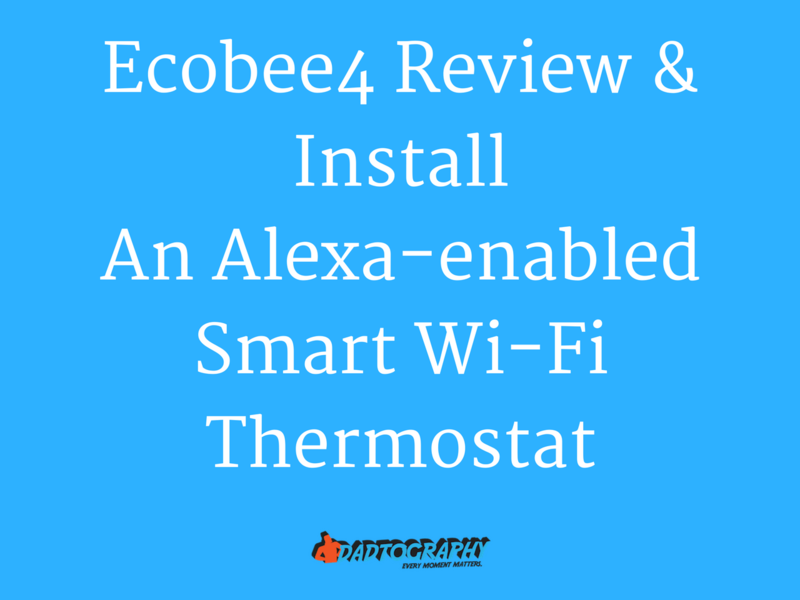 Ecobee4 Review & Install - We install and setup this Alexa-Enabed Wi-Fi smart thermostat (with photos). This is a 100% honest, 100% authentic Ecobee4 review. Dadtography was not compensated in any way for this post. Some links below, marked as (af), may be affiliate links. Sales made resulting from clicks on affiliate links provide a small percentage of each sale to Dadtography.com. All images are Dadtography originals. Please don't use our photos without permission. If you're into home automation and smarthome setup using "IOT" devices, you've likely considered installing a Wi-Fi smart thermostat at some point. But which thermostat is the best for the money? We spent our own money and purchased a new Ecobee4. Is the Ecobee4 easy to install? Is the Ecobee4 the best thermostat on the market? Are smart Wi-Fi thermostats worth the money? We answer these questions and more in our Ecobee4 review. Here's our first impression of the Ecobee4 and our unboxing. Come along as we setup and install our Ecobee4 thermostat. Check out the technical specifications of the Ecobee4 thermostat. A big part of the Ecobee4 experience is the mobile app. Read our thoughts on the Ecobee4 thermostat features. Value is important when it comes to choosing a smart thermostat. Check out our Ecobee4 thermostat frequently asked questions (FAQ). Check out our gallery of images from our Ecobee4 unboxing and install. As many tech enthusiasts would say, unboxing your new gadget has really become part of the overall experience. Apple mastered this with its devices, with high-end packaging and a really great unboxing experience for its devices. The Ecobee4 follows the model that Apple mastered all those years ago and really provides a great first impression, starting with the packaging and unboxing. It may sound funny to some, but I know I'm not alone when I say I actually kept the box to my Ecobee4 thermostat. As you can see from the photos here, the first thing you see is actually a welcoming "hi" message. The box contents are laid out very methodically including the mounting plate, the thermostat itself, the wiring labels and other pieces required to install your new Ecobee4. Ecobee4 Thermostat - How difficult is the install and setup? Once the newness of the unboxing wears off just a bit, it's time to dig into the actual setup and install of the Ecobee4. I will admit I'm not a huge fan of installing electronic devices. I shudder just a bit at the thought of installing a flat screen TV wall mount, for example. The Ecobee4 promised that install and setup would be a breeze, so I decided to give it a try. The install and setup is guided by the Ecobee app, which we have an entire category in this review coming up below. That portion of the review will focus on the app functionality after you have your Ecobee4 up and running. How is the mobile app's guided install for the Ecobee4? I really appreciate that Ecobee understands how challenging the install step can be for some non-technical homeowners. When I see wires dangling from my wall, I'm more inclined to call a professional than try to figure it out on my own. The Ecobee mobile app walks you through the install, step-by-step. We've provided screen shots from each step below in a gallery of images. The mobile app even includes videos with some steps, which can be helpful. The problem with the guided install using the app is that it's impossible for it to be 100% correct for all home owners. I admittedly got stuck on the wiring portion. The wiring label stickers didn't stay stuck for one thing. I also couldn't quite figure out what mapped to what on the Ecobee4. My house has a heat pump, which is pretty unfamiliar to most people "up north", so it took some troubleshooting for me to get it working 100%. Overall, the install steps found in the app were helpful and made me able to get my Ecobee4 up and running on my own. I found most of the steps to be fairly easy, with the exception of the wiring. The app offers two steps where you can take a photo of your wires to refer back to later. I found this feature to be difficult to use in the Ecobee app. My house has a heat pump, which is pretty unfamiliar to most people "up north", so it took some troubleshooting for me to get it working 100%. How is the Ecobee4 Mobile App? The Ecobee mobile application is simple to use, with fairly basic functionality. But it gets the job done. We have Android mobile devices, so we're reviewing that version of the app. All screen shots in this review are from the Android version as well. Once you get your Ecobee4 installed and powered up, I strongly recommend digging into the mobile app. That's where you'll control your device by setting up preferences, setting a schedule, setting and receiving reminders and other functions. What's our favorite Ecobee mobile app feature? The feature we use all the time are the sensor readings found inside the mobile app. We have two sensors - the Ecobee4 itself, plus one additional room sensor. We have the thermostat upstairs with the room sensor downstairs in our living room. The temperature settings you make for your Ecobee4 are based on the average of the temperature readings from all sensors. So, if upstairs is 80 degrees and downstairs is 90, the "average" temperature displayed by the thermostat would be 85 degrees. What's our least favorite mobile app feature? The mobile app as a vacation setting, where you can set the times you will be out of your home on vacation. The idea there is that the Ecobee would auto-adjust the temperature of your home until you return. Rather than use the vacation schedule feature, I set an "away" comfort setting and using IFTTT, the thermostat adjusts the temperature when we leave the home, no matter how long we're gone. What are the major Ecobee4 smart thermostat features? Room Sensors help manage hot and cold spots of your home, delivering comfort to rooms that matter most. Comes with built-in Alexa Voice Service built in, so you can ask your ecobee to set a timer, read you the news, adjust the temperature, and more. Hardwired for reliability means ecobee doesn't steal power from equipment to charge itself. Ecobee4 comes with built-in Alexa Voice Service built in, so you can ask your ecobee to set a timer, read you the news, adjust the temperature, and more. How is the value of purchasing an Ecobee4 smart thermostat? 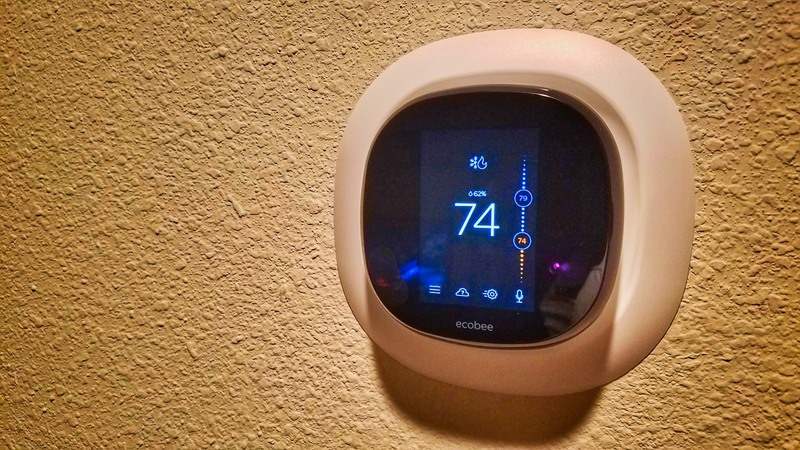 When it comes to smart thermostat devices like the Ecobee4, there are two value propositions to purchasing a replacement thermostat. The first is the cost of the device itself. How much does the Ecobee4 cost relative to its competitors? The table below compares the current retail cost for the most popular smart thermostats on the market today. The second aspect of calculating the "value" of a purchase like an Ecobee4 is the cost savings provided by using the thermostat. We're only a couple of months into the use of our Ecobee thermostat, and in Florida, the winter months are low energy use because of the mild weather. We'll get a better sense of energy cost savings after a full summer of using our new Ecobee thermostat. We'll be sure to provide an update when we have more data to share on cost savings. Q: How many sensors are included with the Ecobee4? A: The thermostat itself is a sensor. One additional room sensor is also included in the package. Q: Can Alexa be disabled on the Ecobee4? A: You can mute Alexa so it will no longer listen. The light stays off unless you are using it or have it in mute. Q: Does the Ecobee 4 work with the previous versions sensors? A: Yes, it does work with the old sensors. You will have to pull out the battery from the back of the sensor and put back in. Then the Ecobee4 will automatically pick up the sensor and ask you if you want to connect. Q: I have two systems at home - up and down-stairs. can i use an ecobee3 upstairs and and ecobee4 downstairs, or do I need to use Ecobee4 everywhere? A: Yes, you can do this! You'll be able to connect the Ecobee3 to your Alexa portal and control it with voice through the Ecobee4. You can also use the app to control both remotely as well. Q: Does Ecobee4 work with Wink? A: According to a manufacturer statement in May, 2017, Wink support will be added. What do you think? Do you own an Ecobee4 thermostat as well? What has your experience been with this smart home device? Leave a comment below! Much improved functionality over the Ecobee3. True home climate automation is possible with Ecobee4. Can act like another Alexa device in your home (responds to voice commands, play music, etc). Remote control capabilities - even outside of your home. It should come with more than 1 extra sensor. Typical Alexa listening issues when other devices are present. Confusing setup and install instructions provided. So many different wiring configurations makes for almost endless install configurations.